Coventry Building Society have recently introduced the Grid Card as a simple form of 2-factor authentication. It replaces memorable words in the login process. Now the idea is that you require something you know (i.e. your password) and something you have (i.e. the Grid Card) to log in - 2 things = 2 factors. For more about authentication see this post. How does it work? Very simply is the answer. During the log in process, you will be asked to enter the digits at 3 co-ordinates. For example: c3, d2 and j5 would mean that you enter 5, 6 and 3 (this is the example Coventry give). Is this better than a secret word? Yes, is the short answer. How many people will choose a memorable word that someone close to them could guess? Remember, that this isn't a password as such, it is expected to be a word and a word that means something to the user. The problem is that users cannot remember lots of passwords, so remembering two would be difficult. Also, having two passwords isn't really any different from having a longer, stronger password, it's still single-factor. The idea behind the Grid Card is that you have a set of random numbers shared between you and the bank that are very hard to guess. I only say very hard to guess because I don't know how they generate the cards in the first place and if this isn't truly random - which it almost certainly won't be - then you can predict parts of the grid given other parts of it. Randomness is a rare but essential commodity. 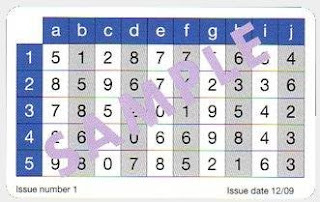 There are 50 co-ordinates on the card and Coventry ask for 3 each time, giving 19,600 possible combinations, assuming they'll never ask for the same co-ordinate more than once per login (order doesn't matter as we're told which grid squares). Does this mean that someone would have to log all 19,600 combinations before they could regenerate the card? No. Each co-ordinate appears 1,176 times in the 19,600. Each pair of co-ordinates appears 48 times. There are only really 17 unique combinations of co-ordinates such that they aren't repeated (and that's a cheat, because one co-ordinate will appear twice if we have 17 as 17x3=51). However, it is unlikely that these 17 would get asked for in succession, so it would take significantly more observations before we have the whole grid, but we won't need the whole grid before we're very likely to be able to login. Indeed, there's a 17.3% chance that at least one co-ordinate will be repeated on the next login. Also, a shoulder surfer with camera phone (or CCTV cameras) could take a photo of the whole card in one go, so this is an authentication mechanism to be used only in the 'safety' of your own home. This is, however, a step in the right direction, so they should be commended for it. What else do you need to login to Coventry? Well, a Web ID and date of birth, both of which are easily pharmed. So the security is based solely on the password and Grid Card, which is better than two passwords. They do also have an anti-phishing technique bundled in there as well. When you sign up you choose a picture that they will display during your login along with your last login date and time. If the picture or date is incorrect then this isn't Coventry (or your account has been compromised). It's good to add a picture here, because many people don't actually check the last login date and time even if it's put up on the screen. The picture is obvious and hard to miss though. These mechanisms don't really stop spear phishing (or targeted phishing), but they do stop blanket or mass phishing attacks. It's about time more banks started issuing 2-factor authentication for login and Coventry should be congratulated on being amongst the first. However, we have to be careful about how it's implemented.